Food Included: Vibrant Isaan food to start, elegant Royal Thai Cuisine to finish; Northern & Southern food in between. Around 15 tastes at 4 local restaurants. Thailand has 4 very distinct culinary regions; we delve into each of them at 4 very different dining establishments. This tour is about showcasing the huge flavour and spice variations of the 4 culinary regions of Thailand. It is designed for the discerning traveller who wants a more leisurely paced food tour. One of the venues we have chosen is amongst Hua Hin's finest spectacular seaside locations, with 5 star views, with all venues truly representing Thai flavours from the 4 regions. We start the tour tasting the vibrant food of the NorthEast - Isaan. This region is known for its grilled meats and magnificent spicy salads. The venue is one frequented mainly by locals and is a beautiful garden setting. 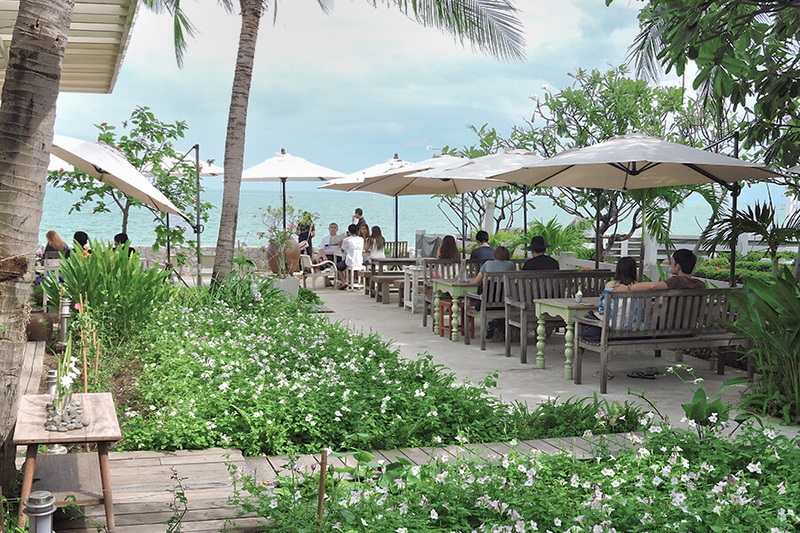 We then sample some of the best Northern Thai food Hua Hin has to offer in a serene, yet hidden garden location. Here we try some classic Northern dishes like Khao Soi ข้าวซอย • Chiang Mai Noodles, a dish reminiscent of laksa. We next head to a very local restaurant specialising in the food of Southern Thailand. We experience what makes Southern food so unique with their use of different spices to develop the flavours. Our tour finishes highlighting food of the Central Region, Royal Thai Cuisine in fact, which is not seen in its true form too regularly. The food and the setting are magnificent. Here we try Khao Chae ข้าวแช่ • Rice In Cool Fragrant Water; a Royal Thai snack unique to the region; this dish will challenge the taste buds. We also try Gaeng Kieow Wan แกงเขียวหวาน • Green Curry. Many will have tried green curry before, but as with all Royal Thai dishes, this one is refined and elegantly presented, with a brilliant depth of flavour. We hope this tour imparts some understanding of the culinary differences of the four diverse food regions in this magnificent country. Sample traditional dishes from Isaan • the NorthEast region of Thailand, known for it's salads & grilled meats. We next head to a venue specialising in the food of Southern Thailand at a very local restaurant. We experience what makes Southern food so unique with their use of different spices to develop the flavours.